Fresh just added a new product to their Sugar Lip Collection. It’s called ‘Sugar Shine Lip Treatment’ and it’s purpose is to improve the definition of the lip area while preserving moisture for up to six hours. The treatment also enhances the natural color of the lips while delivering essential nourishment and a chic sheen. You can wear it alone or apply it on top of your favorite Sugar Tinted Lip Treatment for smooth, supple, youthful-looking lips. You know I’m in the market for youthful looking lips these days. 35 ain’t treating me so kindly… 🙂 Or is it my three kids? I can’t keep up! • Sugar, a natural humectant, attracts and seals in moisture. • Commiphora extract promotes suppleness and helps smooth rough lips. • Cupuaçu and mango butters help nourish, soften, and restore suppleness. • Hyaluronic Filling Spheres help make the lips appear fuller. • Black currant seed and grapeseed oils help hydrate and protect. 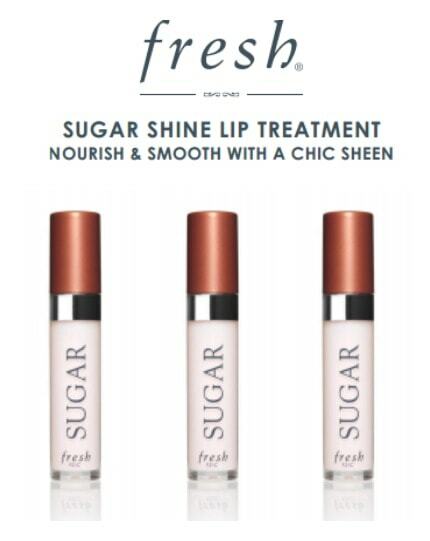 SUGAR SHINE LIP TREATMENT ($18.50) will be available in June 2013 at Sephora.com and Sephora Stores. Previous Post: « Today’s Obsession: Printed Belted Dress Under $30!